The laboratory and the office are at the Department of Pharmacy, University of Naples “Federico II”, via Mezzocannone 16, 80134 Naples, Italy (Subway: Line 1; Stop: Università). Naples is in Campania, a southern region in Italy. It is the third-largest municipality in Italy, after Rome and Milan. Bronze Age Greek settlements were established in the Naples area in the second millennium BC. Then a larger colony – initially known as Parthenope – developed on the Island of Megaride around the ninth century BC, at the end of the Greek Dark Ages. The city was refounded as Neápolis in the sixth century BC and became a lynchpin of Magna Graecia, playing a key role in the merging of Greek culture into Roman society and eventually becoming a cultural centre of the Roman Republic. 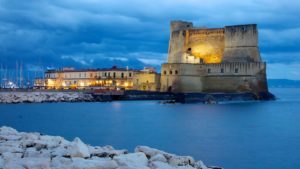 Naples has been for may years a major cultural centre with a global sphere of influence, particularly during the Renaissance and Enlightenment eras. The historical centre of Naples is the largest in Europe, covering 1,700 hectares (4,200 acres) and enclosing 27 centuries of history, and is listed by UNESCO as a World Heritage Site. The Villa Rosebery, one of the three official residences of the President of Italy, is located in the city’s Posillipo district. In the immediate vicinity of Naples are numerous culturally and historically significant sites, including the Palace of Caserta and the Roman ruins of Pompeii and Herculaneum. Furthermore, Neapolitan music has been highly influential, credited with the invention of the romantic guitar and the mandolin, as well as notable contributions to opera and folk standards. Popular characters and historical figures who have come to symbolise the city include Januarius, the patron saint of Naples, the comic figure Pulcinella, and the Sirens from the Greek epic poem the Odyssey. According to CNN, the metro stop “Toledo” is the most beautiful in Europe and it won also the LEAF Award 2013 as “Public building of the year”. The city also hosts NATO’s Allied Joint Force Command Naples, the SRM Institution for Economic Research and the OPE Company and Study Centre. Naples is a full member of the Eurocities network of European cities. The city was selected to become the headquarters of the European institution ACP/UE and was named a City of Literature by UNESCO’s Creative Cities Network. Culinarily, Naples is synonymous with pizza, which originated in the city but the city is not only that. Naples is the Italian city with the highest number of accredited stars from the Michelin Guide. Naples sports scene is dominated by football and Serie A club S.S.C. Napoli, Italian champions twice and winner of European trophies. Airport Naples has an international airport (Naples-Capodichino). Despite Capodichino Airport is the only Naples City Airport, the services are efficient and it offers a variety of flights, allowing people to reach many destinations, including intercontinental ones. The easiest way to reach the city from the airport is by taxi. The taxi stop is located just outside the Airport Arrivals. There is also a bus service, named ALIBUS, which links airport to downtown city. This bus makes two stops: one at the central railway station and the second at Piazza Municipio (near the hotels). The departure of this bus is just outside the Airport Arrivals. Train Naples has mean train station (Naples – Central Station) and high speed train (FrecciaRossa) which links to Bologna, Firenze, Genova, Milan, Rome, Salerno, Turin. The high speed train (FrecciaRossa) connecting Naples to Rome in just over an hour and to Milan in less than 5 hours, via Bologna, Florence and Rome. For more information you can visit the train company webpage: http://www.trenitalia.com. The Naples Central Station is inside the city. Subway, bus terminal and taxi station are connected with the station. Port The Beverello port of the city is particularly large and efficient, with landing places for ferries and hydrofoils arriving from the nearby Tyrrhenian islands, as well as ships which travel much greater distances. Many companies make use of its port. Moving around Naples (local subway and buses) There are several subway and bus lines. Taxi A 24h call center service can be used.